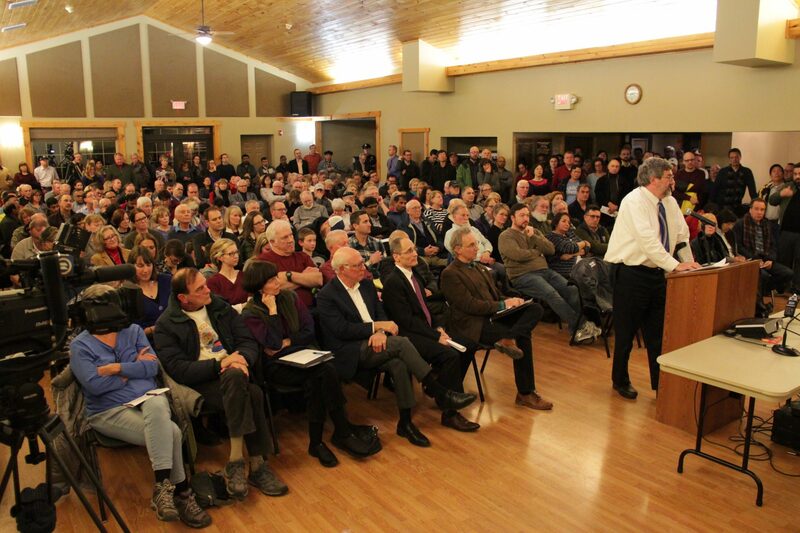 People packed a room for a public hearing on fracking in Franklin Park, Pa. on Monday, Jan. 14. Drilling for a proposed gas well would reach from Economy Borough to Linbrook Park, marked with a star, in Franklin Park Borough. About 200 people packed a public hearing in the bedroom community of Franklin Park outside Pittsburgh Monday night to voice their opinions on a proposal to frack beneath a local park. Findlay Township-based PennEnergy is planning on building a Marcellus Shale gas well in neighboring Economy Borough that would go horizontally into Franklin Park. The borough council is considering whether to lease 81 acres of land beneath Linbrook Park to the company for the project. The proposal would net the borough, one of the most affluent in Allegheny County, $283,500 plus royalties. Several landowners near the park have already leased to the company, and told the council to do so as well. Dave Graff says his family leased its land to the company. He’s worried if the town says no to drilling beneath the park, the company may not drill under his property. “We don’t have millions of dollars like some of the people in this area, and that (leasing money) could be the difference from us being able to preserve this land that we have and not have it sold off to developers and (have) all the trees obliterated and all the water and habitat for the wildlife destroyed,” he said. But many more residents showed up to oppose the idea. Loretta Pusateri, a former teacher, said she’s worried about studies linking fracking with health effects, especially for children in the area. A survey mailed by the borough to residents in April found that 55 percent were opposed, to 37 percent who were in favor of the lease. The survey got a 31 percent response rate. The council could vote on the proposal Wednesday night.